Maintaining a balance between the expectations of your career and your home life is no easy task. Many times, a poor work-life balance can result in you getting burnt out in your career or feeling like your work life is carrying over into your home life. For example, stressful work situations or encounters throughout your day can still affect you at home, as you may feel anxious, depressed, stressed, and can’t enjoy your time off. Continuing down this unhealthy path will eventually leave you feeling dissatisfied and unhappy in both your career and personal life. 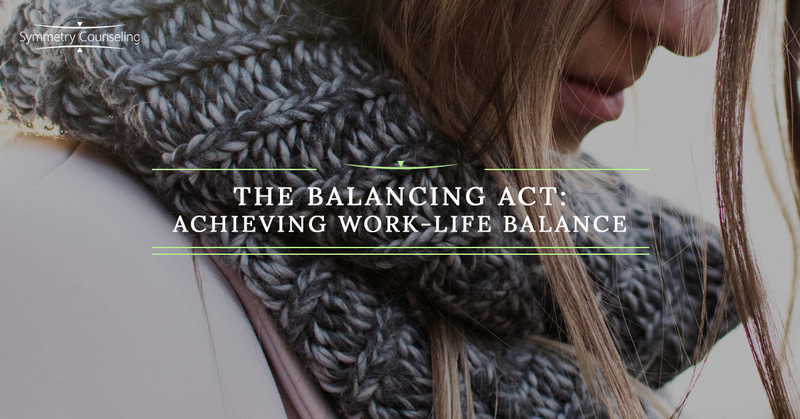 Below are a few steps you can take to begin to achieve a healthy work-life balance on a regular basis. Technology such as email and video chat allows us to connect anywhere at any time. This convenience, however, can also lead to the expectation of 24-hour availability. If you find yourself checking your emails frequently when you are at home, staying late at work most days, or constantly answering work-related phone calls once you have left work for the day, it is time to re-evaluate your boundaries. Try putting some boundaries in place for yourself such as only checking your emails once per night, leaving work by a certain time every day, or only staying late at work once per week/month. Creating and sticking to these boundaries will help keep work at work and allow you to enjoy your free time with no strings attached. It will be extremely difficult for you to be your best self when you are exhausted and run down. Therefore, it is important to turn your work-self off and embrace self-care in your free time. Try balancing work with self-care activities such as working out, meeting with friends, personal hobbies, or eating dinner with your family (unplugged). Allowing yourself to rejuvenate through a healthy self-care routine will aid you turning off after work and enjoying your time off. Regardless of what you choose to do with your free time, it is crucial to keep self-care in your schedule even when it feels like it is too full. There may be times you feel overwhelmed at work or at home but never ask for help. Whether you ask a colleague for help on a project, move a meeting that you feel is too late in the evening, getting a babysitter for a night, or come in to see a therapist for stress management, it’s important to get the support you need. While asking for help can seem embarrassing or shameful, it is not. Asking for help or guidance will benefit you by allowing you to invest fully into the things you can manage and feel like you have more control of your life. Don’t be afraid to ask for help, for it may change your life for the better. If you would like some guidance creating a healthy work-life balance, it may be useful to connect with a therapist. Contact Symmetry Counseling at 312-578-9990 to set up an appointment with one of our very skilled therapists today!